Quote of the Blog: "Where the wine is Born, grows and matures... There are no secrets." Its time for the second blog to start with the "B" Bold letter as it is the second letter in the English Alphabet. Good Simile; I like to use Simile-Figure of speech. Although 15 August, is the Independence Day in India and Holy Day of Obligation, Assumption Day in other countries. At the same time Beijing Olympics going on, But I am here to talk about "B"Logging of B world of Cyprus. Guess what!!! "Bold Beautiful Babes, Bathing near the 'Baths of Aphrodite' Beach, in Bikini and Bra, playing Beach Vollyball, Beveraging Beer in Bar, Blowing with Blue Boat"
A Beautiful song can be written, composed and picturized based on these lines. I think, I have to talk with Britney, Bryan Adams and Beyonce, but that is for later stage. 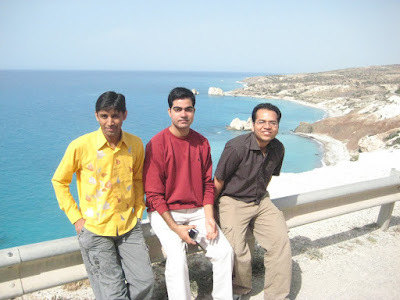 Cyprus is an island having rich cultural heritage and steeped in the history. Cyprus is also called "the island of Aphrodite" since in Greek mythology, the goddess Aphrodite, of beauty and love, was born in Cyprus. There are still some B words in the Bedroom of Cyprus. In the day-time if you want to tan your skin then go under the sunbrella, rub some sunscreen, have sunbath at Blue Flag designation beach like 'Baths of Aphrodite' or Agia Napa. Do the adventurous water sport - Bungee Jumping, The sensual adrenalin experience. and at the night side enjoy the Belly Dancing with the Arabian music with Burger and Beer. I won't bore you with the B word now as there are Birding, Buffavento Castle, Bellapais Abbey and many more things that adds Beauty to the Cyprus Island. You see B word is sticking like a Big B (Bee) in my B-log. I am Basked now. So this is my "B"logging in Cyprus.